It's 700ml but can carry 800ml of water, so it's perfect for small or large shakes. And for $7 each or $12 for the triple multi pack (whilst stocks last) you will not find a better value shaker in Australia. Place whisk in bottle, pour in water or milk, follow with your choice of protein powder. All the nutrition is in the shake....not in the shaker!! One of the better quality shakers I've purchased. Solid design and appears to be one that'll last a while. Not much more to say there. I can chuck this in my bag or in the car and be sure it won't leak into my bag. Goes through the dishwasher just fine. Somehow this shaker is easier to clean than my others, the BPA free perhaps? Love it! Simple shaker, great value for it's price. Love the black colour. And being BPA Free is also a plus! This shaker is real value for money and mixers my shakes brilliantly. Great for making shakes but a narrow cup means using a stick blender can be troublesome. Measure your blender before you buy. This is a really good shaker, smoothy or water bottle. The lid stays firmly shut when you need it to, and the springy blender inside does the job of mixing your protein powers. A great reliable and serviceable shaker at a good price. Good shaker, does the job its meant to do. Not the highest quality you can get but for $9 you really can't beat it value-for-money wise. Great shaker! So cheap in comparison to everything else on the market and looks great too. Quality shaker! Not only is every single product fantastic, the emails witty and enjoyable. Now even the shaker accessories are better then ever. Its a huge size and washes out amazingly. BPA free water bottles will cost your around $20 as they are but a shaker bottle that's not even $9 is just insane. If profession Whey create a product its all about quality for price and they beat any industry leader in value for money and product quality easily in my opinion. I got 2 of these shakers, both are high quality and have a great seal. Mixes well, looks better than the typical clear ones and has a nice bright logo. Good to breakup my shaker collection with something different! I make nut milk with this shaker now! It has many uses in our home. I add some crushed nuts, add filtered water and then give it a shake. Leave it for a few hours or overnight so that it is ready for the next morning, and then I shake it again, strain the nuts with a tea strainer. Voila! I have fresh nut milk for a protein shake! Great Shaker, no plastic residue taste like most shakers. No BPA! Good as a water bottle too! A great shaker and BPA free, so no tasties were used to make this shaker. We all use these for our protein shakes, but I also use it for a water bottle during my cardio workouts as it is better than most of the expensive stainless steel sports drink bottles I have purchased to-date. I disagree with the comments made by Wade Thomas regarding the quality of this shaker. Apples for apples, the shaker he previously owned wouldn't have cost a mere $8.95 and let me tell you that for this price, this shaker has no opposition in the market place. The quality of this shaker including it's firmly securing lid is unquestionable...I expect nothing less from Professional Whey. Great for mixing my protein shakes and for using as a wattle bottle. I ordered two of these by mistake but not a mistake I regret. I now have one for home in the mornings and 1 at work so never miss a meal. Mixes my whey powder in no time at all and get's it super smooth. Be careful to get the coil out of the sink once you have washed it. Easy to forget. I love the size of this shaker, I can add the liquid I need and still have room for a good slosh around. It doesn't leak anywhere and the subtle design is great. 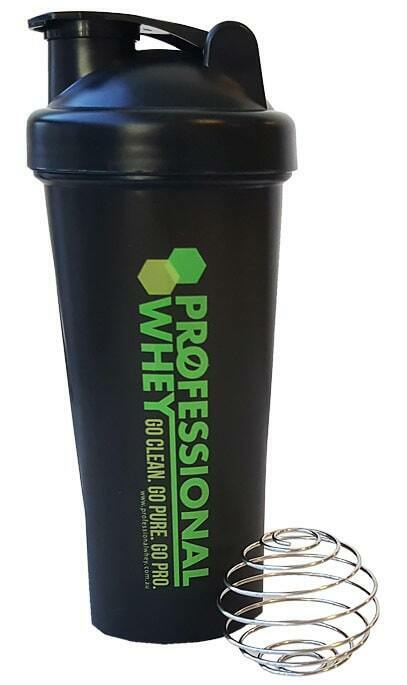 Our 700ml BPA Free protein shaker has a secure screw lid ensuring no spillage. 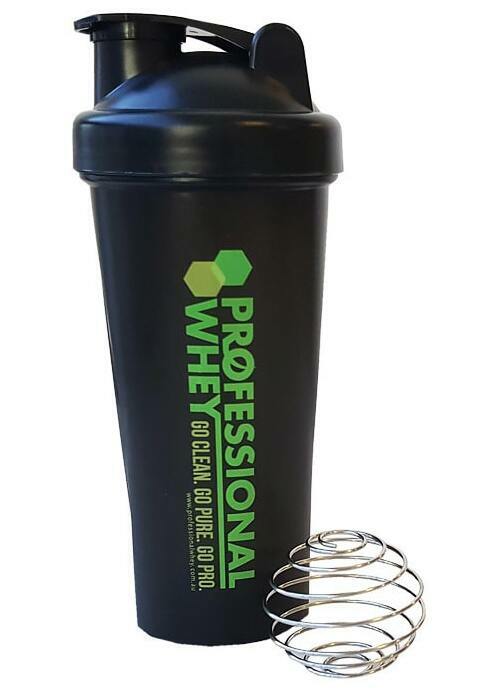 Each and every shaker comes with its own small circular stainless steel wire ball that acts like a whisk in order to smoothly blend your protein shakes. It’s BPA free, and comes as a black shaker with the option of 3 different coloured lids - black, green or lemon - making it a lot easier to prep your pre workout drink, post workout shake and daily protein smoothies.